Yummy cat food slices for a convenient and fresh meal. 12 x 100g moist cat food pouches for adult cats made with carefully prepared recipes. 100% complete and balanced meal with no artificial flavours, colours or preservatives. With balanced mineral levels to support a healthy urinary tract and Zinc which helps ensure a healthy skin & coat. WHISKAS® cat food pouch contains nutritious and tasty pieces to give your cat the meals she loves. Quality, protein ingredients in every single meal, ideal for everyday feeding. Simple, nutritional cuisine suitable for all breeds that contribute towards your special pets wellness. Succulent cat food slices for a convenient and fresh meal. Everything your adult cat naturally needs to live happy and healthy in her adult life. 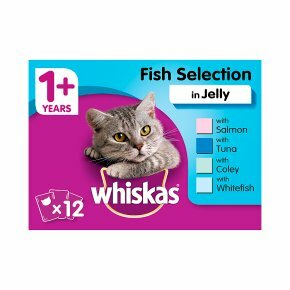 Available in 100g WHISKAS® individual packets. 24h Daily Feeding Recommendation Pouch Only: 3kg 2 1/2, 4kg 3, 5kg 3 1/2 Pouch + Dry Food: 3kg 1 1/2 + 15g, 4kg 2 + 20g, 5kg 2 1/2 + 15g We recommend to feed a mix of WHISKAS® wet and dry food. 76 kcal/100g Feeding instructions: Allow a transition phase and adjust amounts according to your pet's needs. For overweight cats reduce daily amount. For more information on feeding your cat, please contact our Consumer Careline. Fresh water should always be available.